I saw this ad in the window of my local Spar a couple of years ago. I’ve often wondered if it worked. 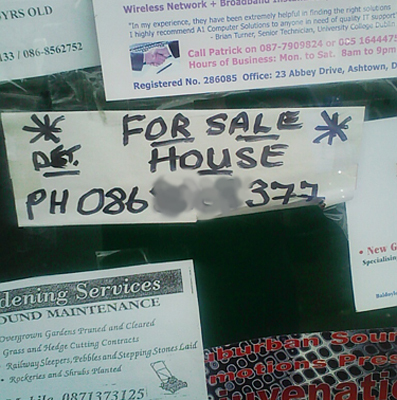 You can buy and sell houses in the, er, Buy and Sell, can’t you? When I first realised, at about 21 years of age, that estate agents charged large fees for selling your house (which you want to do) to someone (who wants to buy it), I thought, ‘What a scam’. Absolutely nothing, certainly not the collective brass-neck of auctioneers wanting to up their fees to make up for the income shortfall when the number of house sales started to drop, has changed my mind since. And this guy did a bang-up job all on his own; note the “det”, presumably meaning “detached”. Sure what else do you need to know?